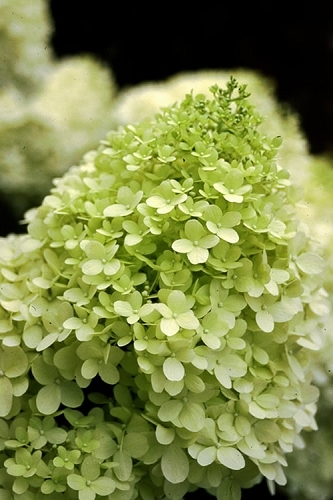 It's not unusual during hot and very humid summers for hydrangea to develop spots on their leaves. The first thing to know is that leaf spots on Hydrangea rarely if ever cause serious injury or death to the plant. Light spotting is unsightly and heavy spotting may temporarily reduce plant vigor and flower bud set. through October. The spots form due to water drops from rain or irrigation that sit on leaves during hot and humid conditions. This is especially true in large plant nurseries and residential or commercial landscapes that use overhead irrigation frequently. When using overhead irrigation it is best to water in early to mid morning so the sun can dry the water from foliage. 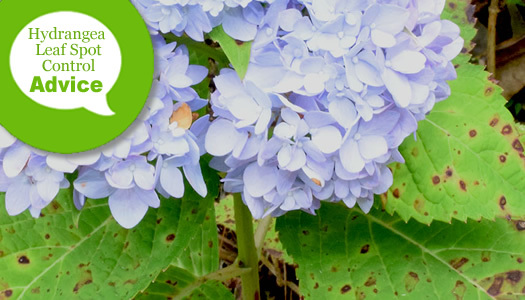 Read on to learn more about leaf spot on hydrangeas and how you can prevent or treat plants if necessary. 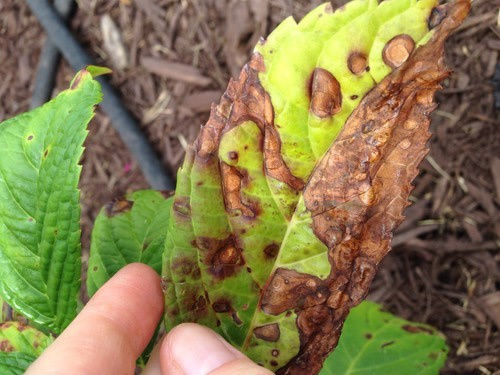 Two types of fungal diseases can infect hydrangeas - Cercospora leaf spot and Anthracnose. Cercospora leaf spot is a common disease that usually infects when leaves are regularly wet by rain or irrigation. 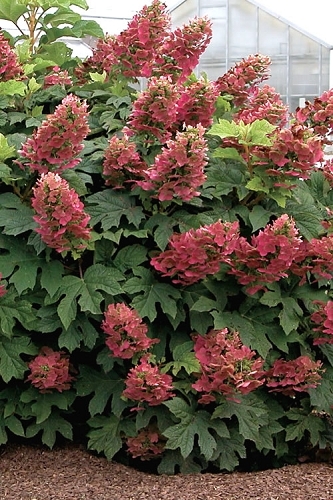 It begins as brown or purple spots on the leaves at or near the base of the plant. The circular spots are often small and scattered and usually measure 1/8 to 1/4 inches in diameter. 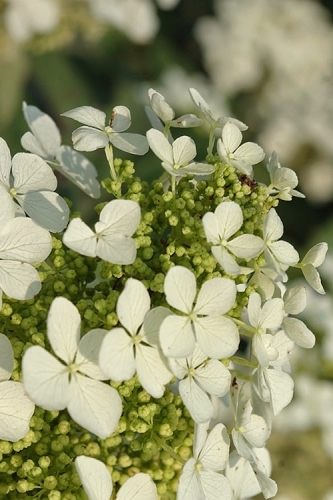 Spots on the bigleaf hydrangea develop tan or gray centers surrounded by brown or purple halos. Leaves may eventually turn yellow-green and fall off. 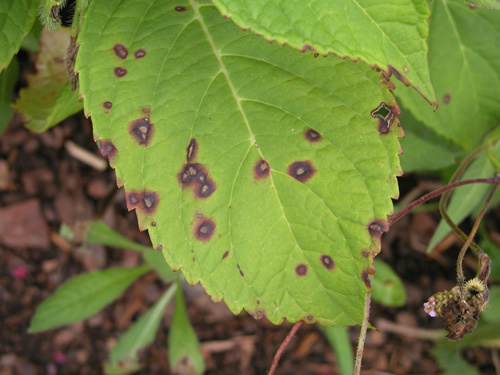 While Cercospora leaf spot rarely if ever kills the target plant, heavy spotting of the leaves and premature leaf shed is unsightly and may reduce plant vigor and flower bud set during the current season. If possible, avoid splashing of water on leaves by watering around the base of plants. Also, when watering provide only enough water to keep the soil around the roots moist but not constantly soggy or wet, which can lead to other harmful plant diseases such as root rot. Rather than splash a little water around plants every day it's best to deep soak less frequently, allowing soil to dry somewhat between watering. Remove dead or heavily spotted leaves and discard them. Apply a shrub and tree type fertilizer to maintain a moderate growth rate. That said, cease fertilization two months prior to the average first-frost date in your area. Since the appearance of symptoms doesn't occur until mid to late summer, protective fungicide sprays are rarely needed for the control of this disease. 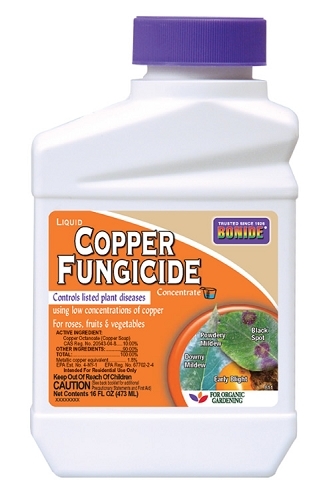 That said, on plants that suffer noticeable damage every year, treatment with a copper-based fungicide can be helpful. Begin treatment in late spring or early summer if and when symptoms appear. Refer to the product label for mixing and application instructions. Anthracnose occurs sporadically in the landscape and only effects bigleaf hydrangea (Hydrangea macrophylla), what some folks call "mophead" or "French" hydrangea. 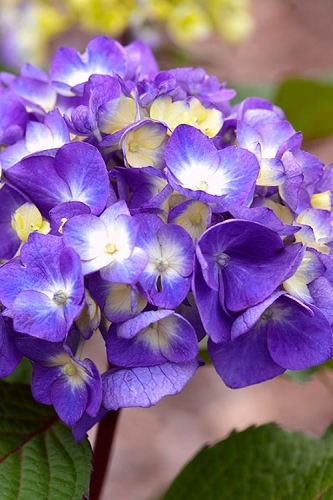 These typically produce large snowball-shape flower clusters in shades of blue, pink, red or white. 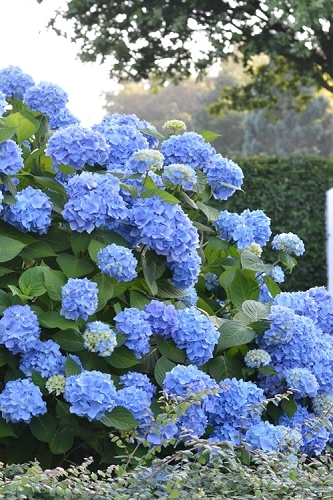 Since this disease appears to be more prevalent in large greenhouse or field plantings of intensively managed hydrangea, damaging outbreaks of this disease in residential landscapes are unlikely, but possible. 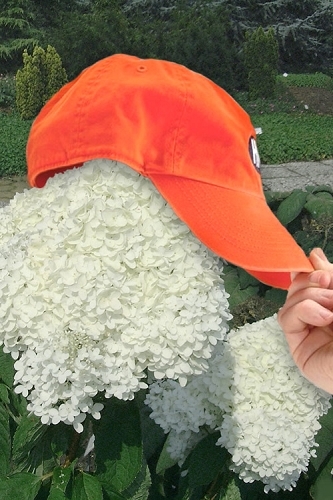 The causal fungus Colletotrichum gloeosporioides can attack both the leaves and the blooms of hydrangea. Hot, wet weather conditions appear to favor disease development. Heavily fertilized plants seem to be more susceptible. 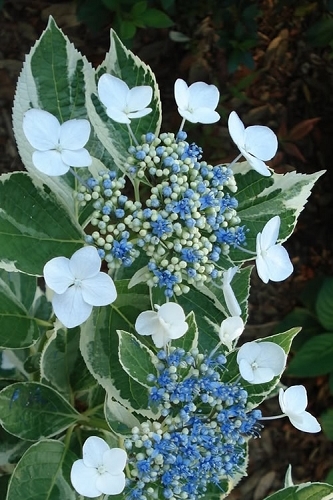 At first, the brown spots are circular or slightly irregular in shape and somewhat sunken on fleshy leaves of hydrangea. The center of these spots may reach 1 inch or more in diameter and turn light brown to tan in color. Alternating dark and slightly lighter rings of dead tissue often give the spots a bull’s-eye or a target-spot appearance. When larger spots border midvein or other major veins in the leaf, they become distinctly more angular in shape. Under ideal conditions for disease development, large, dark brown, irregular blotches may spread across the leaves and flower petals. Unlike Cercospora leaf spot, symptoms of anthracnose may appear almost simultaneously on leaves and blooms in the lower and upper regions of the plant. 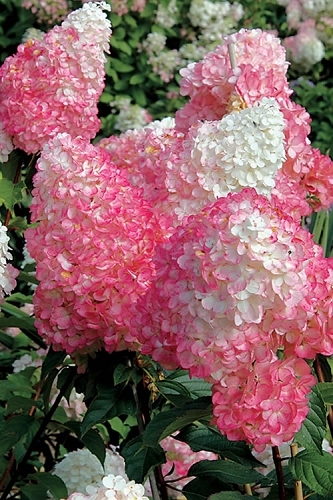 Few options are available for controlling anthracnose on Hydrangea. Collecting fallen disease leaves and removing blighted blooms are suggested. If possible, avoid water splashing on leaves when watering. Water around the base of plants. When watering, provide only enough water to keep the soil moist but not constantly soggy or wet, which can lead to other harmful plant diseases such as root rot. Rather than splash a little water around plants every day it's best to deep soak less frequently allowing soil to dry somewhat between watering. Spraying foliage and flowers according to label directions with a copper-based fungicide can be helpful. Spray healthy flowers and foliage next summer before spots appear.